For some the Nokia Collection area of the Marketplace has been featuring all of the OEM apps available for Windows Phone (much like HTC, Samsung, LG, etc. have on their handsets), but for others this collection of apps has been missing since the Lumia handsets have been released. We've had the Nokia Collection missing from our European handsets, but our U.S. colleagues have had access to the collection. 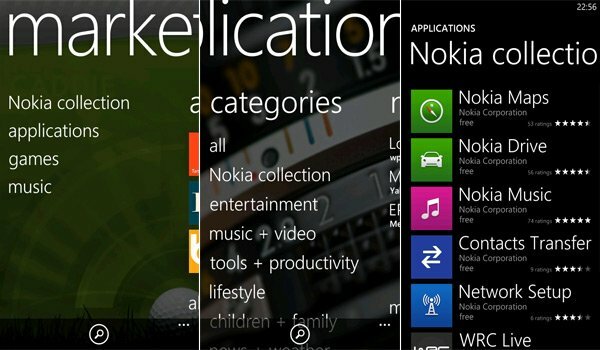 Our Jay Bennett has just noticed the additional menu entry just above 'applications' (see above screenshots) being made available, but I still can't see anything on the Lumia 710 (unlocked) or 800 (unlocked and carrier locked). Though the Nokia apps can be found via Marketplace search, should a reinstallation be required. Let us know if you're able to access the Nokia Collection on your Nokia Windows Phone in the comments.